Home » Painting Holidays France » Chateau Vincennes, sketching and rather a lot of steps. Day three, Tuesday April 17. Still trying to get to grips with the new phone, I decided to go to Vincennes, which, as the crow flies is not far, and just a short ride on the metro. So new toy in hand I thought I would do a little test video as an introduction and here it is. Once inside you will find yourself climbing a lot of steps and exploring many empty rooms. Important historically, you can Google it for yourself, I just found it a little dull. Still, I did have the opportunity to sit and watch the local kestrels at close range, sketch a few people and stroll through the town which is charming. It looks rather ‘gentrified’ with some posh shops and I imagine some posh prices. Previous PostCat’s and a diverse community in Montreuil. Next PostPottering about and just enjoying the radical change of scene. 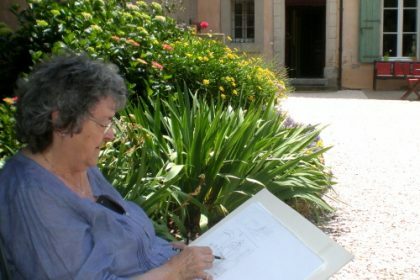 Coming on a painting holiday on your own is EASY – if you join one of my groups.